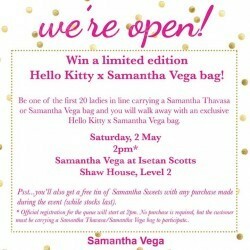 Win an exclusive Hello Kitty x Samantha Vega bag. Be one of the first 20 people in line with your Samantha bag at their new Samantha Vega store at Isetan Singapore (Scotts) this Saturday! No purchase is required, but you need to bring along a Samantha Thavasa or Samantha Vega bag to participate. Queue registration officially starts at 2pm. they'll also have other shopping treats and tea nibbles there, so come down and say hi! 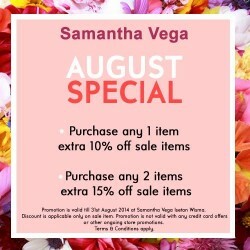 Shop sale items at Samantha Vega Isetan Orchard! Get 10% off sale items when you purchase any regular item, or 15% off sale items when you purchase 2 regular items or more.